It was no ordinary Christmas. Ruby Kruckenberg was born nine weeks early on the morning of December 25, weighing a mere 2lbs, 11 oz. Her parents, April and Jeremiah, knew they were in for a long stay at the NICU. That’s when they learned about the Ronald McDonald Family Room at St. Luke’s. While Ruby was being treated in the NICU, April spent most of her days at the hospital while Jeremiah went to work. 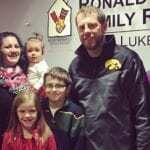 In the evenings, he would bring their other kids to the hospital where they could eat as a family in the Ronald McDonald Family Room. But during the day, April felt a longing to spend time with others. The Ronald McDonald Family Room gave April an outlet to talk to other families, making her feel welcome and raising her spirits. Everyone she met had a different story to tell, but they were all united under a common thread that April could relate to. Through these conversations, she developed friendships that she keeps to this day. During a time of immense chaos and loneliness, the Ronald McDonald Family Room offered the Kruckenbergs stability and comfort. The day they watched the nurses remove Ruby’s monitors was a surreal moment for April and Jeremiah, who delighted at the opportunity to finally take their daughter home. Today Ruby is right where she belongs: at home with her parents and siblings—a complete and happy family.